On Time Wine Grape Harvesting – Cacciatore Fine Wines & Olive Oil Corp.
By harvesting grapes at peak maturity, Cacciatore Fine Wines & Olive Oil Corp (CWO) ensures optimum color, sugar, acid, tannin and berry firmness for the grapes we crush to produce OPTIMUM, LA GONDOLA and GOOD DOG wines. From bunch formation in June until harvest, we monitor the grapes weekly. Watching closely for the above characteristics ensures adherence to our pick-on-time policy. After analyzing the monitoring information and conducting a visual inspection of the vineyard, the master winemaker alone decides which day and what time to begin the harvest. Harvesting grapes between 1 a.m. and 6 a.m. helps guarantee the crispness of the berries, and the cooler temperatures of early morning help avoid a premature fermenting cycle. 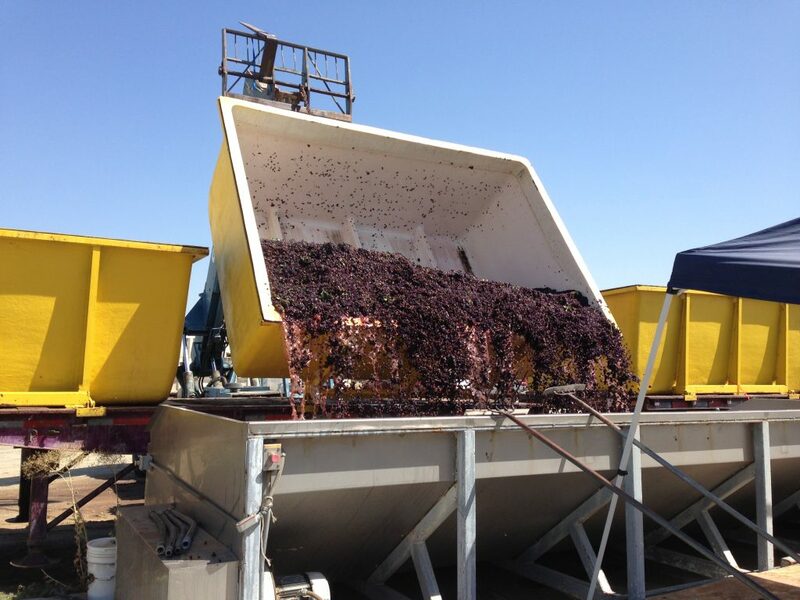 Our process of mechanical harvesting gently drops grape bunches onto a soft rubber rolling belt, deposits them into a gondola, and loads them onto a flat bed truck. Once loaded with four gondolas, the truck hauls the grapes to the winery where a stainless steel receiving vat stands ready to initiate the venting cycle of destemming the grapes. The time from vine to vat is approximately two hours, thus preserving the natural character of the grape variety. To further ensure our pick-on-time policy, CWO owns four mechanical harvesters and 12 gondolas.